I did receive a complimentary copy of this cookbook but I shared it because I love the recipes and the author! The Jumbo Lump Crab Pot Pie from The Gourmet Kitchen Cookbook by Jennifer Farley may be one of the best pot pies that’s ever come out of my kitchen. I wish that January came in June. Ok, you know, not the month January obviously but the “New Year Resolution part of it”. You know, the part where everyone tosses out the cake and starts munching on celery sticks like it’s their job. Come on y’all! It’s cold! Not only is it cold but it’s snowing in a lot of places right now and we’re all bundles up around fire places. We need comfort food right now, not carrot sticks! We need dinners that are going to warm up from the inside out, not green smoothies for breakfast lunch and dinner! That’s why I wish the whole healthy bandwagon that people jumped on come Jan 1st was actually June 1st. I mean think about it. June 1st is when it’s hot, fresh amazing fruit is in season, the farmer’s markets are over flowing with local farmer’s harvests, that time of year just SCREAMS healthy eating..not January 1st under a blanket of ice and snow. 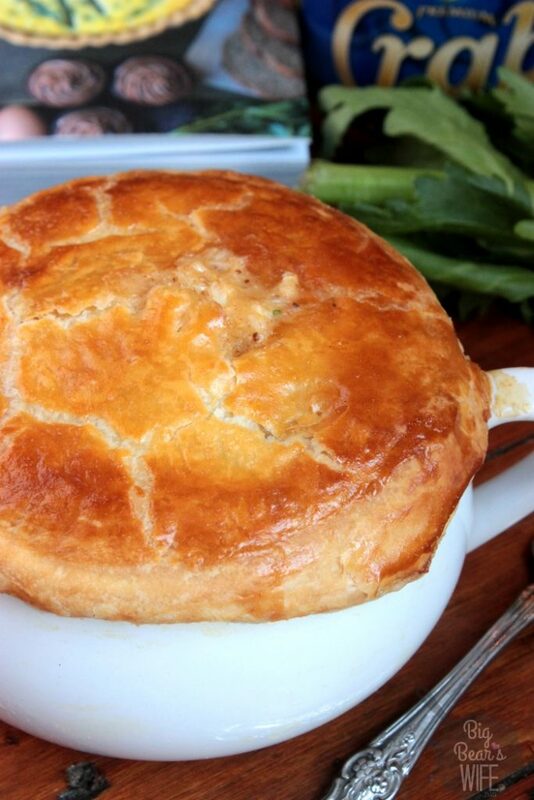 January needs comfort food like this Crab Pot Pie! 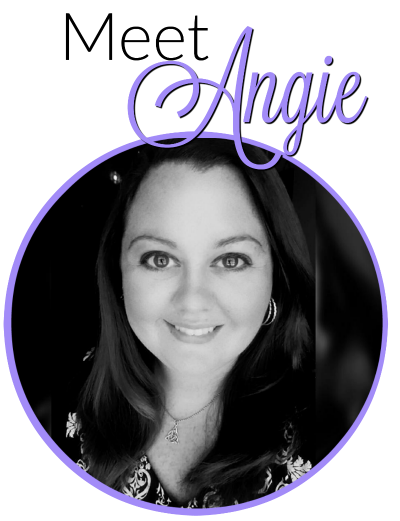 Last year on the blog I decided to stay true to myself and blog about the things I loved and the foods that were popular in my southern family when I was growing up. I didn’t start the New Year off with green smoothies and healthy eating tips. I didn’t start last year off with Power Protein Packed yogurt cups or get skinny omelette recipes, nope last year my very first blog post of the year was about Hot Chocolate Cookies. 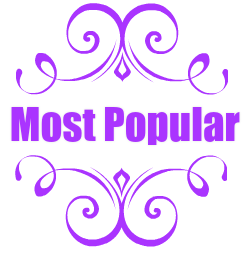 That Hot Chocolate Cookie recipe became one of the most popular recipes for the entire year, landing at #2 for the Most Popular Recipes on BigBearsWife.com for the entire year. I stuck to what we love and people loved it. Don’t get me wrong, I love a good smoothie (I’m kind of addicted to them haha) but I won’t be changing up the recipes on the blog just because it’s a new year. I’ll still be blogging about our favorite southern comfort foods just like I have been. That brings me to the first recipe of 2017! Crab Pot Pie! Oh sweet heavens y’all, this may in fact be one of the best, if not THE BEST, pot pie to ever roll out of my kitchen. Sadly, I can’t take the credit for coming up with the recipe, but oh man it’s good. 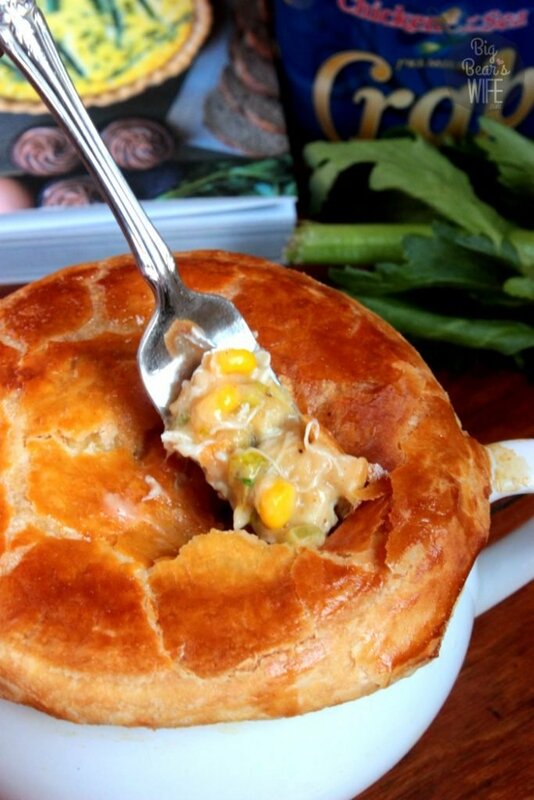 This crab pot pie recipe comes from the new cookbook, The Gourmet Kitchen Cookbook which was written by my friend, Jennifer Farley. You maybe recognize Jennifer from her outstanding blog, Savory Simple! 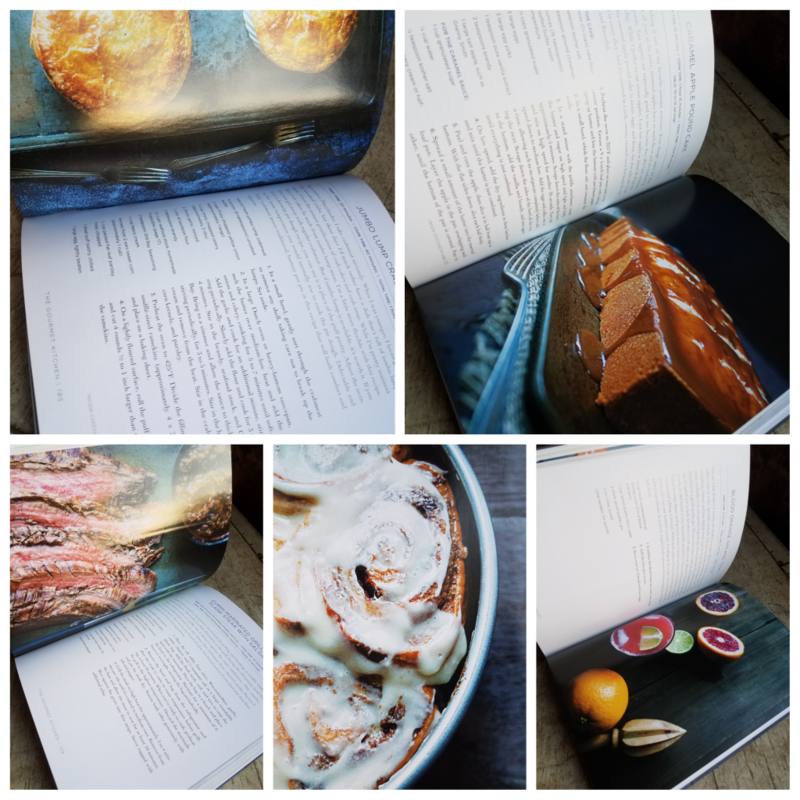 I received a review copy of her first cookbook and I’ve loved looking through it’s pages. “The Gourmet Kitchen ” is one of the prettiest cookbooks that I have flipped through this year. 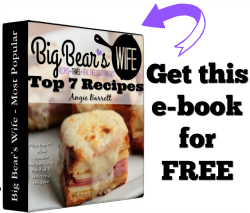 There are so many beautiful recipes in this book, yet they all seem so easy to make! There are so many recipes in this book that I want to make. 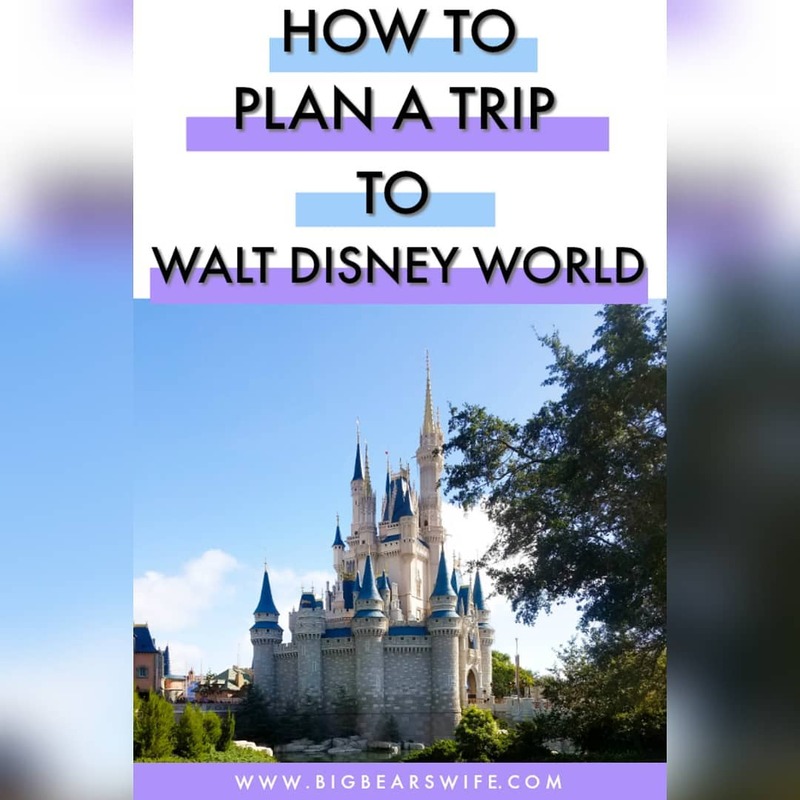 When I was trying to figure out which recipe to share on the blog, I handed the cookbook over to Thomas and asked him to pick a recipe because I just couldn’t choose. 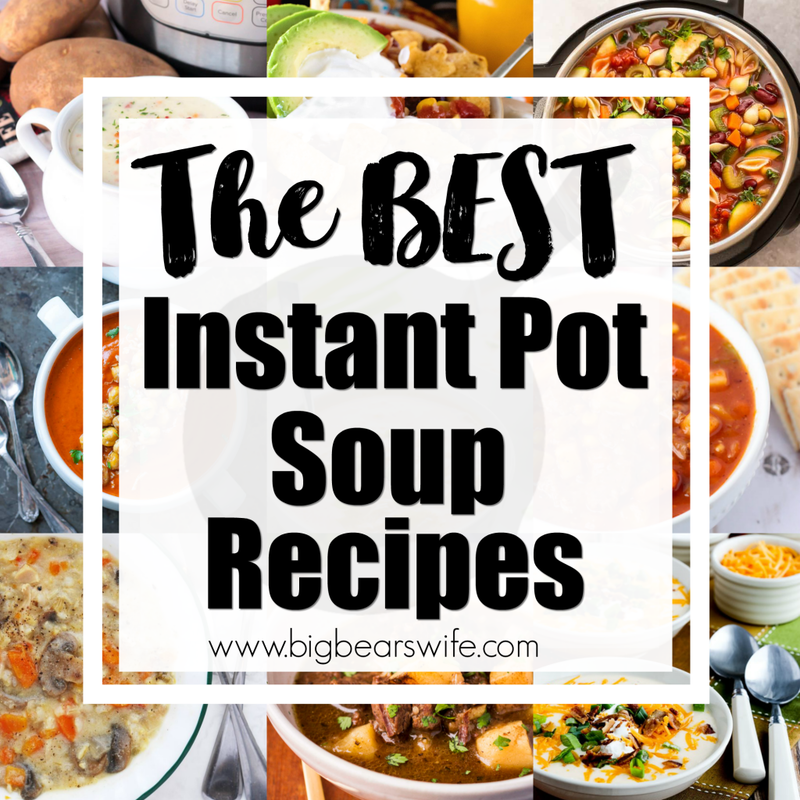 I was in love with so many of her recipes that I couldn’t narrow it down to just one. Thomas picked, the Jumbo Lump Crab Pot Pies! We don’t live on the coast so I had a bit of a time finding fresh crab meat but I found it and the search was worth it. 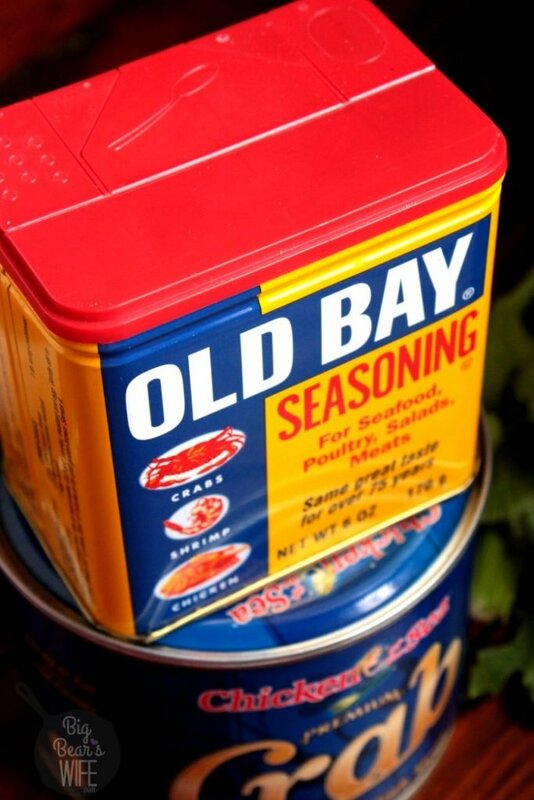 You’re also going to need to pick up a little can of Old Bay if you don’t already have some in the pantry. 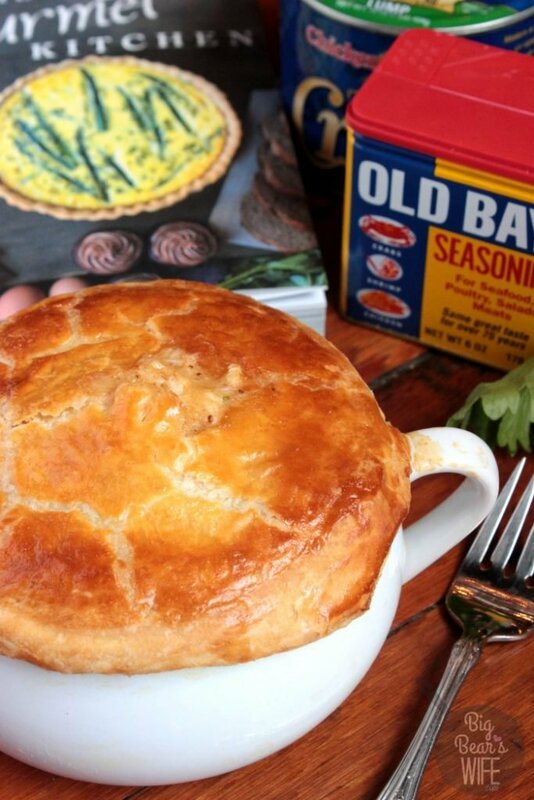 From start to finish, these Jumbo Lump Crab Pot Pies are going to take about an hour. Not too bad for a delicious, comforting meal! Now I suppose that you could make this Jumbo Lump Crab Pot Pie into one giant pot pie, but Jennifer broke it down into 4 individual Jumbo Lump Crab Pot Pie servings and so did I.
I love it when everyone has their own individual pot pies or bowls like this for dinner. Oh my word, and I’m not even sure that I can begin to tell you have creamy and fantastic this pot pie really is. I mean I’ve eaten quite a few pot pies throughout my life and this was one of the top, for sure. 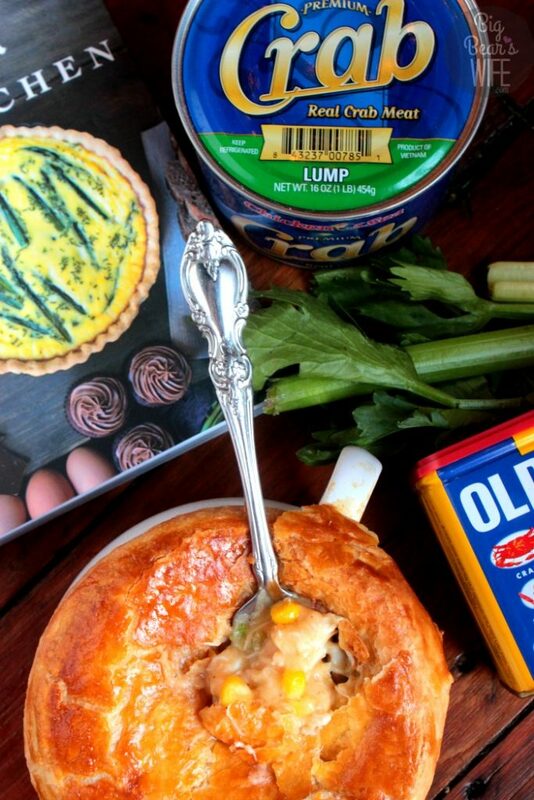 The Jumbo Lump Crab Pot Pie from The Gourmet Kitchen Cookbook by Jennifer Farley may be one of the best pot pies that's ever come out of my kitchen. In a small bowl, gently sort through the crab meat to remove any shell, taking care not to break up the lumps. Set aside. In a large Dutch oven or heavy-bottom sauce pan, melt the butter over medium-low heat and add the onion and celery, cooking for 5-7 minutes until soft. Add the garlic and cook for an additional minute, stirring periodically. Slowly add the flour and cook for 3-4 minutes. Stir in the brandy, seafood stock, and Old Bay. Bring to a simmer and allow the sauce to thicken, stirring periodically, for 3-5 minutes. Stir in the heavy cream and remove from the heat. Stir in the crabmeat, corn kernels, and parsley. Divide the filling into 4 souffle-sized ramekins (approximately 4 x 2 inches) and place on a baking sheet. On a lightly floured surface, roll the puff pastry thin and cut out 4 rounds 1/2 to 1 inch larger than the width of the ramekins. Brush the egg wash on the rim of each ramekin and 1/2 inch down the outer side. Top with puff pastry, folding the excess over and gently pressing it against the ramekins (a fork can also be lightly pressed against the pastry to help seal it to the dish). Brush the top of the dough with a light coating of egg wash, and use a small knife to poke 3 small holes in the top of each pot pie. This will help vent the steam while cooking. 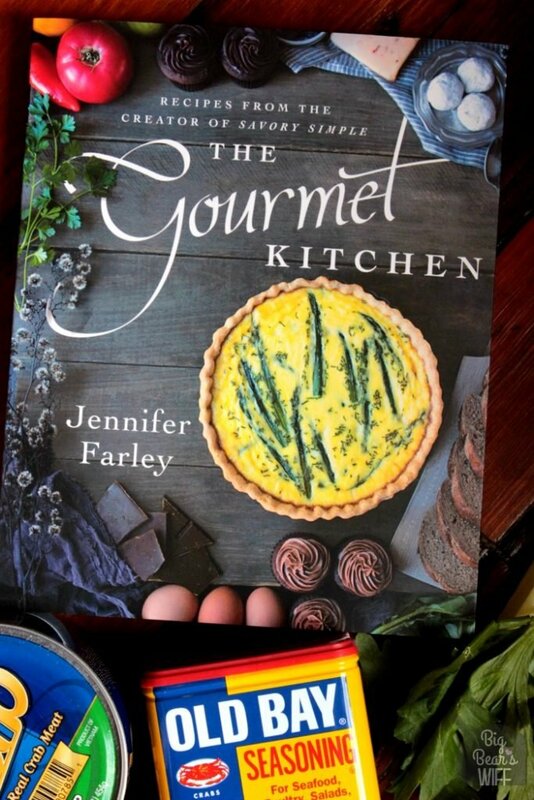 To find out more about Jen’s book, “The Gourmet Kitchen ” check it out on Amazon! 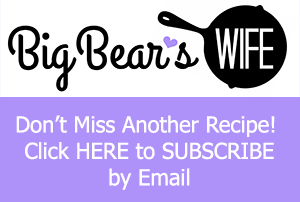 You can also follow Jen online through her blog, Savory Simple and on Facebook! Definitely going to have to pick me up Jennifer’s book. It looks great! 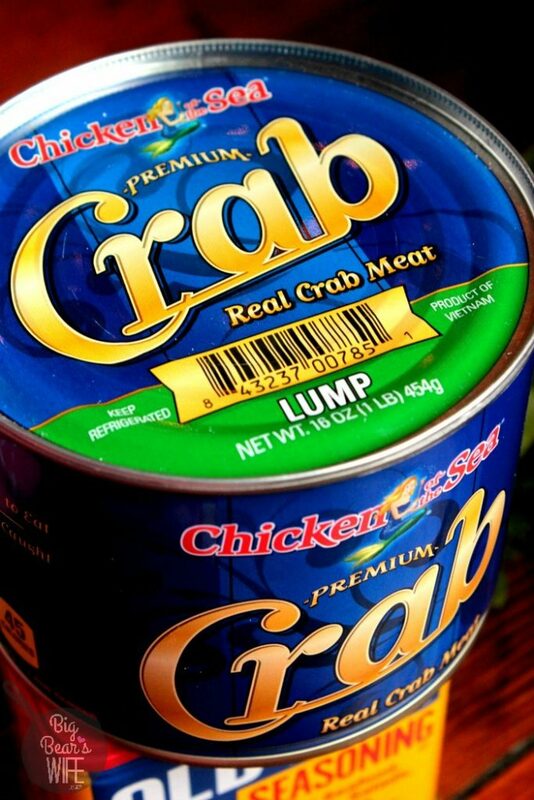 I always have a can of Old Bay in the cupboard, but have never seen that crab meat. Will have to get some because I know this will be a hit with the family! January *totally* needs comfort food. 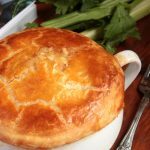 And this pot pie sounds absolutely wonderfully decadent and PERFECT for combatting the cold weather! I just love Jen’s cookbook! I will have to try this recipe! Wow, that looks and sounds amazing, my husband would especially love this! That crust looks amazing! Can’t wait to make this pot pie! I just don’t bother with the healthy bandwagon thing. 😀 And this pot pie looks magical! Love Jennifer’s recipes. This looks delicious! I can’t wait to check out the cookbook!